Shuttr began life as a Kickstarter project. It is a beautifully designed and executed remote shutter release for the iPhone (and Android phones). Once it is set up, you simply press the camera button on the remote to take photos from a distance. Simple selfies! Shuttr is a breeze to set-up and use because it pairs with the iPhone effortlessly. Turn it on when Bluetooth is in the discoverable mode on your phone and connection is almost instantaneous. Muku Lab’s design is sleekly minimal with a satin matte case that has only three controls. On the right side is a sliding on/off switch, on the left side is an iOS/Android switch, and front and center is the camera button that releases the shutter. There is a tiny green LED that indicates pairing and also glows when the device is on. Included with Shuttr is a little plastic leg that plugs into the headphone jack on your phone. 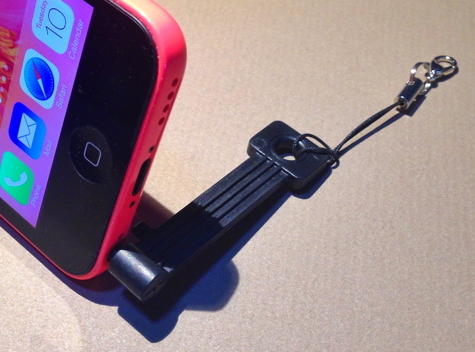 Using this, you can prop your phone on a secure surface and back away to take your photos. A little satiny drawstring bag is also included. 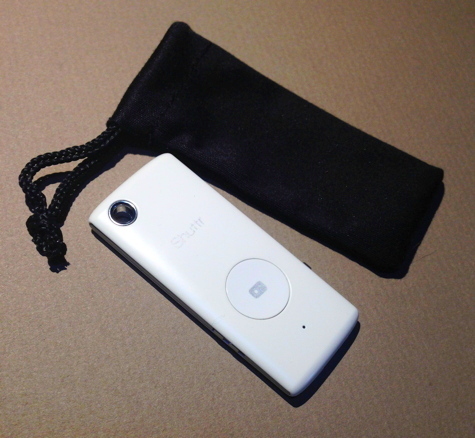 At a mere one inch wide (2.4CM) by 2-3/8 inches (6CM), Shuttr is easily pocketable. Muku Labs incorporated a hole so the device can be hung on a keychain. Shuttr is powered by a single CR2025 battery that should last a long time as the device is not used for extended periods. The device is available in black or white. Other than being a bit expensive, there is much to like here. Shuttr is a fun gadget to take on vacation or a family event where group photos will be taken. It’s a gorgeous piece of creative technology that is elegantly designed.